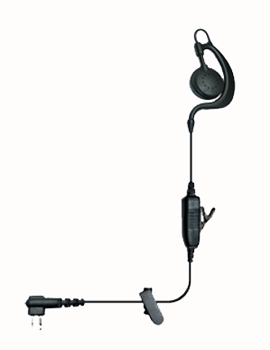 Also refer as the Hybrid kit, this surveillance kit uses an in line microphone and PTT button and an over the ear, quarter sized, earpiece for communications. Not as discrete as the 2-wire surveillance kit, since a person standing next to the user may hear the conversation if the volume is loud enough, the Hybrid kit allows for discrete communications in theaters, open areas without lots of noise, schools, houses of worship and conference rooms. The swivel earloop allows the user to use the hybrid kit on the left or right ear.